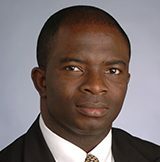 Dr. Kofi Appiah-Okyere directs a program at Syracuse University that, among other things, administer special programs for high school students who are preparing for college transition. He manages a leadership exposure program in partnership with a Big-4 CPA firm. He also leads the accounting section of the university’s college credit program; this program partners with a couple hundred high schools in six states and five other countries. He has partnered with CPA firms, NABA and AICPA to recruit, retain, and place diverse sets of students in the financial industry. Kofi earned his MBA from Indiana University and his PhD from University of Wisconsin-Madison. He is a licensed CPA with experience in Big-4 public accounting, corporate leadership and global educational consulting. He is actively engaged in the financial services profession and holds memberships in the American Accounting Association, Association of International Certified Professional Accountants. He has earned several awards for teaching, research and university services.